A journalist shoots in front of a model table of the Mombasa-Nairobi standard gauge railway project during a promotion in Nairobi, Kenya, on June 16, 2014. 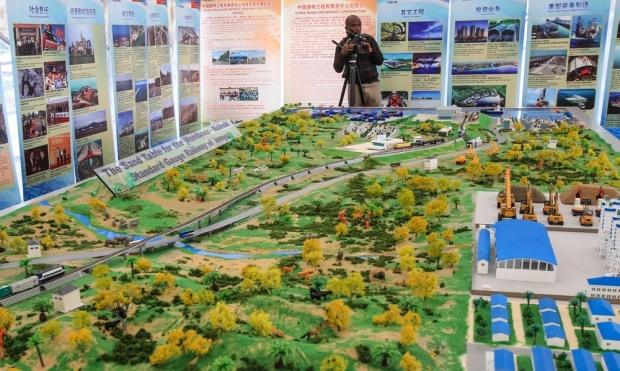 The Kenyan government and China Road and Bridge Corporation jointly held a promotional briefing about the railway project. “The African way of life is under attack by Chinese corporations,” argues University of Technology, Sydney doctoral candidate Onjumi Okumu. The Kenya native contends that a combination of weak governance in African mixed with no legal restraints on Chinese corporate behavior encourage PRC companies to behave illegally and destructively in Africa, destroying the continent’s fragile social capital. Okumu focuses, in particular, on the effects Chinese investments are having on the people of Kenya. It’s a provocative, controversial, and fascinating thesis.